This course is the basic study of limits and continuity, differentiation, optimization and graphing, and integration of elementary functions, with emphasis on applications in business, economics, and social sciences. 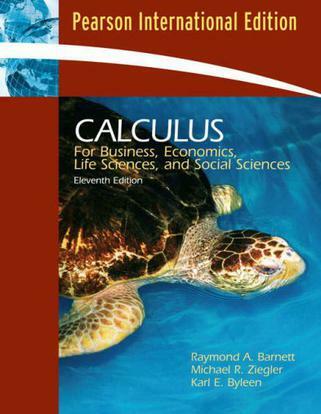 This course is not a substitute for MATH 2413, Calculus I.
Amazon.com Calculus for Business, Economics, Life Sciences, and Social Sciences, 14 th Edition includes Chapters 1-11 and is generally used for a 2-semester course. Calculus for Business, Economics, Life Sciences, and Social Sciences, Brief Version contains Chapters 1-8 and is designed for a one-term course in Applied Calculus.